Florida's Homestead Law - Shalloway & Shalloway, P.A. Florida’s homestead laws touch three distinct areas: (1) death, descent and distribution (2) property tax and (3) asset protection. 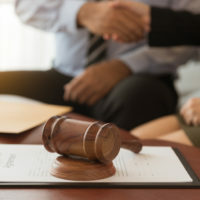 Working with a Florida Elder law firm is vital to understanding the interaction between these laws and implementing a holistic plan that optimizes the benefits each affords. The Florida Constitution and Statutes jointly address how a homestead may be distributed upon the owner’s death and the consequences of an invalid devise of the homestead. An example of this complex issue can be found in Section 4(c) of Article X of the Florida Constitution, which states in pertinent part that: Homestead shall not be subject to devise if the owner is survived by spouse or minor child, except the homestead may be devised to the owner’s spouse if there be no minor child. The owner of homestead real estate, joined by the spouse if married, may alienate the homestead by mortgage, sale or gift and, if married, may by deed transfer the title to an estate by the entirety. So in essence, whether or not you were married at the time of your death and whether or not you were survived by minor children are hypotheticals you must carefully consider when implementing any estate planning. Further, a Florida resident who owns homestead property is entitled to two tax exemptions with respect to the assessment of real property taxes. Jointly, the two exemptions can reduce the tax assessed value of the homestead property up to $50,000. Such reduction commonly translates into an annual tax savings of a few hundred dollars. In order to benefit from these tax breaks, the individual must take the affirmative steps necessary to qualify the home as the homestead. The application for homestead exemption and other exemption forms are available on most county property appraisers’ websites. Finally, the Florida homestead exemption is an asset protection tool used to protect homestead property from levy and execution by judgment creditors. In other words, an unsecured creditor cannot force the sale of your homestead to satisfy a judgment. The Florida Constitution defines homestead as one’s principal place of residence up to one-half acre within a municipality and up to 160 contiguous acres outside a municipality. Courts have liberally construed homestead property to also include condominiums, manufactured homes, and mobile homes. Unlike the tax exemption, there is no waiting period or form to complete for the Florida homestead asset protection exemption. The protection simply attaches the day you first occupy the property with the intent to make it your permanent Florida homestead. For clients also considering Medicaid planning, Florida homestead property is not factored when determining eligibility for Medicaid and is considered as a non-countable asset. So, you could own a home with $560,000 or less in equity, and still qualify for Medicaid. To analogize, just as the unsecured creditor cannot force the sale of your homestead, the Medicaid Recovery Unit can only recover from your estate the amount that exceeds $560,000.00 in equity in your Florida homestead property. Please reach out to Shalloway and Shalloway, P.A. to learn more.